A photograph of the city of Beijing. According to the ESCAP Economic and Social Survey of Asia and the Pacific, China is estimated to register a 6.9 per cent real GDP growth in 2017. Economies in the Asia-Pacific region registered robust growth in 2017 and prospects for this year look promising, the United Nations development arm in the region said, urging countries to take advantage of positive conditions and address underlying vulnerabilities. “The prospects for mobilizing financing for development purposes are promising,” said Shamshad Akhtar, the Executive Secretary of ESCAP, which is based in Thailand. According to the Economic and Social Survey of Asia and the Pacific – ESCAP’s long-running flagship publication – developing economies are on track to record an overall growth rate of 5.8 per cent in 2017, compared with 5.4 per cent the previous year. At the same time, “rapid technological advancements, while promising immense opportunities are also posing considerable challenges in terms of job polarization and income and wealth inequalities,” said Ms. Akhtar. Tax reform and strengthening tax collection could also add as much as 8 per cent to the gross domestic product (GDP) of countries such as Myanmar or Tajikistan; and about 3 to 4 per cent in larger countries, like China, India or Indonesia, according to ESCAP. 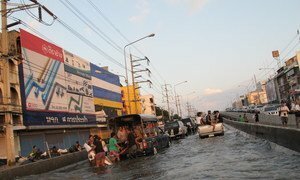 Economic losses to disasters in Asia and the Pacific could exceed $160 billion annually by 2030, the United Nations development arm in the region warned on Tuesday, urging greater innovation in disaster risk financing.